I'm a doctor of volcanoes. It's like geology, but for impatient people. Here's a little tale of what research I used to be involved in. The spine of an ancient magma flow, now exposed at the surface in Arizona. I used to study maar-diatreme systems, the second most common type of volcano in the world. In recent decades, major fieldwork studies have greatly advanced our knowledge of these violent formations; despite this, much of the interpretation is strongly debated. My original contribution to volcanological research is twofold: firstly, successfully simulating maar-diatreme systems using analogue experimentation in order to determine the processes that generate them; secondly, using mathematical modelling to produce a predictive model for their total energy release during an eruption. This study uses a tripartite, quantitative approach: (1) bench-scale experiments are used to generate simulated maar-diatreme volcanoes and examine their eruption and depositional processes; (2) these are qualitatively compared and quantitatively scaled to both field-scale experiments and natural maar-diatreme volcanoes; and (3) the 1886 maar-forming Rotomahana eruption is used as a case study for a new thermodynamic model which gives a first-order calculation of the cumulative energy change during the event. A new conceptual model of maar-diatreme formation is conceived based on a synthesis of the findings of this thesis, which you can download here if you’re feeling so inclined. I published a few papers in a couple of academic journals, which was, er, fun. 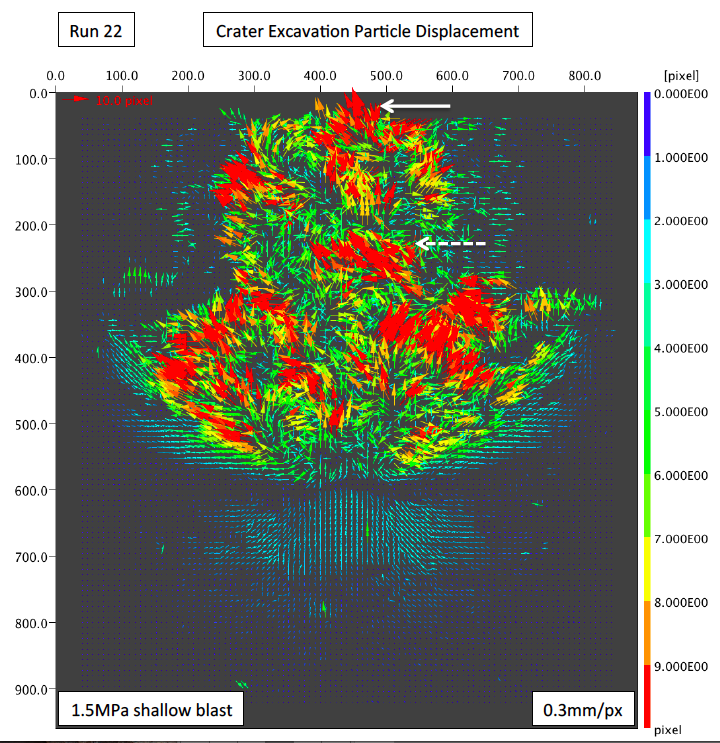 Particle image velocimetery (PIV) of an exploding artificial volcano. Yes, this is actual science. What the hell was that? Explain it to me like i'm not a scientist, please. Maar-diatreme volcanoes are weird depressions that erupt and form once, when magma and water explosively mix. No-one’s really sure how this type of eruption – a “phreatomagmatic” blast – forms maars, which is a shame, because they tend to kill plenty of people. Considering that my case study eruption site in new Zealand wasn’t available to visit for various, curious reasons, I used artificial volcanoes, both in laboratories and in field-scale experiments, along with a sprinkling of mathematics and a pitch of physics, to try and solve all of the things. I did not solve all of the things, but I did produce a new model suggesting a) these volcanoes form in a few different ways, and b) putting volcanoes in rigidly defined classification boxes isn’t helpful. There are volcanoes called maars, and they are violent and mysterious in both their eruptions styles and formation. I made fake volcanoes – with the help of a fantastic research team scattered all over the world – to try and find out. I found some of the things out, but not all of the things. Uh huh. So, got any papers published? Yep. Here's one in Geophysical Research Letters, another in the Journal of Volcanology and Geothermal Research, and another in the Journal of the Geological Society. What was the weirdest Part of your research? I now know a lot more about nuclear weapons than I thought I would. The craters left behind by these mechanical monsters are oddly similar to those created during certain phreatomagmatic eruptions. 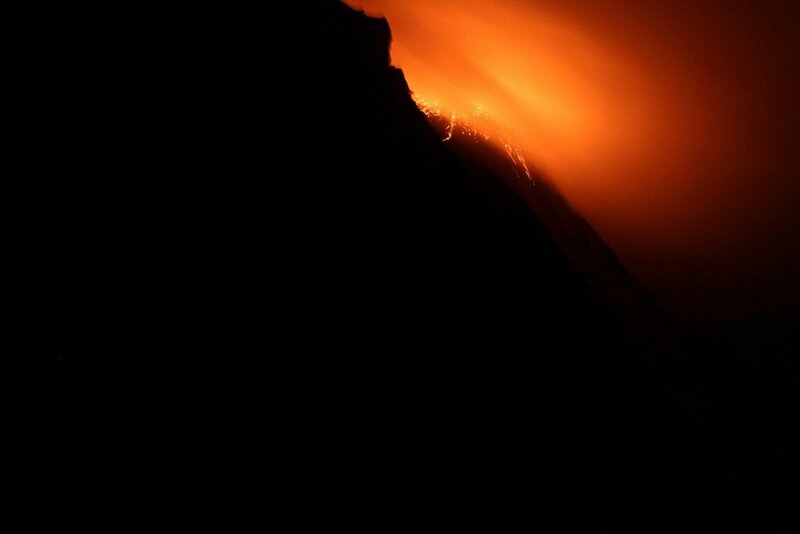 This is what it looks like when you are running away from an erupting volcano in the dark and your headlamp dies. Can you speak to volcanoes or something? No, sadly not. That would be a great superpower though. If you fell into a volcano, would you survive? Yes! But that’s only because the volcanoes I studied don’t have lava flowing inside their craters. They basically die as soon as they form, which, you know, is dramatic of them. Can chris pratt and his dinosaurs outrun a pyroclastic flow? Sadly, no. His head might even explode when it catches up to him. Yeesh. You must be fun at parties.